The Hampton Lady Pirates Volleyball team won their first game of the season, 3-2, Friday night, defeating crosswater rival Norfolk State University on the road in a five set thriller. The sets went back and forth throughout with Hampton winning the first and then alternating sets until their ultimate victory. 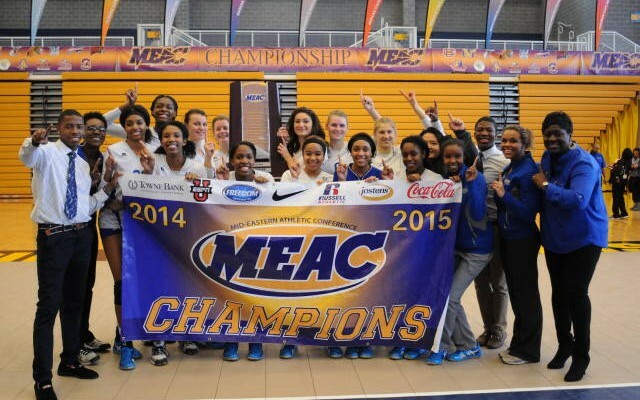 The win was also Hampton’s first win in the MEAC conference. It was an all around team effort as the Lady Pirates were able to get the win behind a core four-headed tandem led by senior outside hitter Allysa Medina and includes freshmen outside hitter Reeana Richardson, middle blocker Kyndall Nicholas and rightside Lena Washington. Medina had 11 kills and 2 blocks on defense. Richardson had a team high 21 kills, 3 aces, and 3 blocks. Nicholas put up 10 kills and 6 blocks while Washington contributed 10 kills and six blocks. Hampton scored a total of 83 points in all five matches compared to Norfolk State’s 74. “Everyone had the desire and the fight to win! But my mentality the whole game was to just play smart and play hard and, if it wasn’t for the team playing great defense and my setter Bri setting me perfect sets, I wouldn’t have been able to lead the team in kills. But I’m so ecstatic we won,” Richardson said following the game. With any rebuilding team that lost as many seniors as Hampton did the previous year, it is a process to find where the new go to plays and players will come from as they attempt to create a new winning identity and tradition. Head coach Janay Yancey and her staff have been doing their best to put the girls in position, doing all the right things in practice, but just hadn’t been able to break through. With the victory, Hampton’s five match winning streak over their rivals was extended, which is good for “Battle of the Bay” bragging rights for Hampton. Moving forward, The Lady Pirates will have to briefly enjoy their first win and turn right around to play their next opponent, Maryland Eastern Shore, who are 15-3 overall. This matchup will give Hampton another good matchup to compete against and see just how far their first win brings them. One win goes a long way, and affects the team morale. Hopefully, for the Lady Pirates, their first win impacts the team positively and they use this momentum to get a streak going to improve their overall record and see the fruits of their labor. Patience is a virtue, but the Lady Pirates are always putting out their best effort for their school, which is all one could ask for.